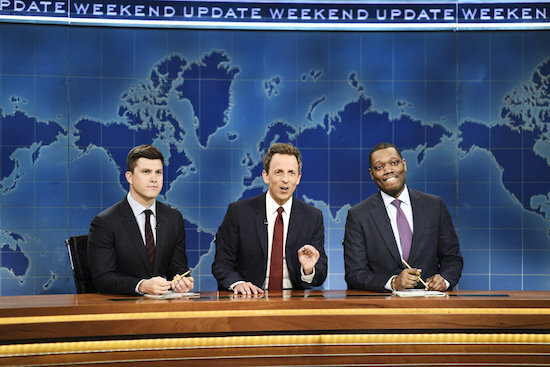 Seth Meyers returned to his old SATURDAY NIGHT LIVE stomping grounds, and, naturally, he popped in for a brief Weekend Update segment. The recent meeting between President Trump and Kanye West prompted a “Really!? !” segment—sadly, sans Amy Poehler—which had Meyers, as well as current Weekend Update hosts Colin Jost and Michael Che baffled about what the heck went down. 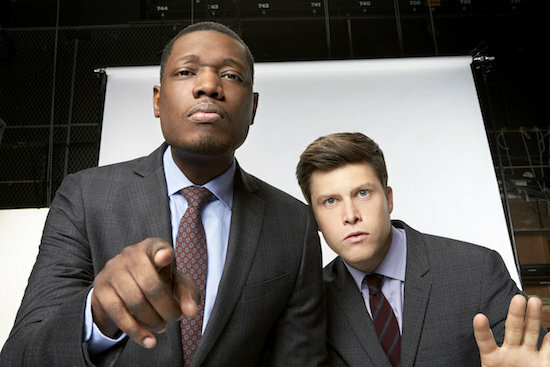 NBC has named SATURDAY NIGHT LIVE Weekend Update co-hosts Michael Che and Colin Jost as the 2018 Emmy hosts. “NBC is thrilled to be the home of this year’s Emmy Awards and with Colin and Michael in the driver’s seat as hosts, along with surprise appearances by other cast members of SATURDAY NIGHT LIVE, I think we are in for one of the funniest awards shows in a long time,” said Robert Greenblatt, Chairman, NBC Entertainment, in a statement. “We’re proud of our deep comedy roster at NBC, and Michael and Colin—along with the return of king of comedy producer Lorne Michaels—will make this the must-see comedy event of the year,” added Paul Telegdy, President, Alternative and Reality Group, NBC Entertainment. Since Seth Meyers now has his own nightly show, there’s a new face at the SATURDAY NIGHT LIVE Weekend Update desk: Colin Jost! What did you think of Jost’s first Weekend Update?